Sun Dolphin Excursion 10 - No More Excluded Fishing Spots! » Sun Dolphin Excursion 10 – No More Excluded Fishing Spots! Are you looking for a fishing kayak that will get you into those excluded fishing spots that a regular boat can’t? Well, You have found it in the Sun Dolphin Excursion 10! This kayak has everything you would want in a fishing kayak. It has plenty of storage, affordable, not too big, and not too small. The Excursion 10 is the perfect one man, 10-foot, sit-in fishing vessel. This fishing kayak is lightweight at only 4o total pounds. So you can easily carry it from fishing spot to fishing spot with ease. There is a nice big storage compartment on the bow of the kayak that’s held shut with shock cord deck rigging. The storage compartment is useful for storing your fishing tackle and gear it keeps it out of the way when you are not using it. The Sun Dolphin Excursion 10 can hold up to 250 pounds so you can bring plenty of your fishing gear with you and you don’t have to worry about capsizing or sinking the kayak. Why Should You Own a Sun Dolphin Excursion 10? There are many reasons to own a Sun Dolphin Excursion 10. It’s an affordable investment compared to other kayaks on the market. The Excursion has many awesome features you don’t always find in a fishing kayak. Like a cockpit that’s big enough to maneuver around when you need to change positions when your casting. It’s stable and won’t capsize easily because of its made of UV-stabilized Fortiflex high-density Polyethylene. 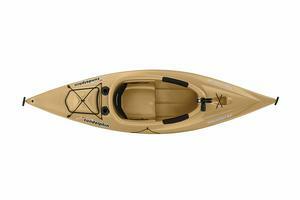 This kayak is lightweight you can easily carry it from car to lake or river to river. It paddles and tracks easily which helps keep you stable in the water. It also has 3-rod holders, two of them are flush and one of them swivel. The padded seat is adjustable. The foot braces keep your feet planted in place so they don’t slide all over the inside which can make it difficult to maneuver the kayak. 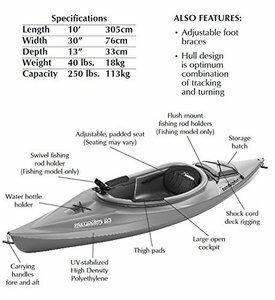 This fishing kayak also has a big storage space with deck cord shock rigging and a water bottle holder that stays in place with a bungee cord. The paddle holder will keep your paddle in place when you are not using it. Having a paddle holder helps you be able to put the paddle down and fish without having to worry about the paddle falling into the water and thus losing the paddle. With all the features and little to complain about I highly recommend getting the Sun Dolphin Excursion 10. 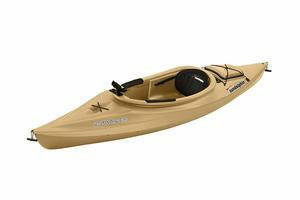 This fishing kayak will get you into places you just can’t normally go with a boat, canoe or bigger sized kayak. You can pick one up on Amazon with free shipping to boot if you are an Amazon Prime Member. Get your Excursion 10 today I know you won’t regret it. Previous Post Ugly Stic Tackle Bag – The Perfect Tackle Bag For Kayak Fishing Next Post Garmin Striker 4 Review – Mark Those Hot Fishing Spots with Ease! Thank you Aweda. I’m glad you get some value from my website. Happy Fishing! Thanks for this really enlightening post on the sun dolphin excursion 10 kayak. After reading your blog post, I must say I like the fact that this kayak is light, this means I can easily carry it. I also like the ample space in the cockpit, should make sailing much more comfortable. After purchasing this product, does the Amazon prime member free shipping cover worldwide delivery? As far as I know, shipping is free worldwide as long as it is fulfilled and sold by Amazon. Actually the price on this is not bad compare to what we’re looking at. Our family loves fishing and Kayaking. Your very detailed review helps a lot. I think this should really help speed up our decision on which fishing kayak to buy. This sounds like a better option. Can’t wait to catch some fish with it already lol. Thanks for sharing. You are welcome, Sheila! Hope you catch your limit of fish. Happy Fishing! Nice article on sun dolphin excursion 10.i like every piece of the review . Thanks, Ajibola. I’m glad you enjoyed the review! Hey Corey, this is a wonderful product with reliable cost. Your analysis is in depth and covers all essential feature of Sun Dolphin Excursion 10. I’ll consider it gifting to my brother living near the countryside. You have highlighted its pros and cons. Since paddles are sold separately, so I hope I can order it in amazon along with Sun Dolphin. Or, do I need to physically purchase the paddles from the shop? Thank you so much for providing a review of Excursion 10. It’s really helpful. You can purchase the paddle for the Sun Dolphin Excursion 10 Kayak on Amazon. Here is the link to the paddle: https://amzn.to/2Emnyct The paddle is only $33 which is a good price for a quality paddle. I hope your brother enjoys his kayak. The sun dulphine excursion 10 really has amazing features for fishing and I like it. There is a lot to benefit from it and is quite different from the rest of other kayak out there in the market. I know every fisher will love this and it can increase one’s interest in the fishing career., this is because it’s suitable for the work it was designed for. Your welcome Kenny. Kayaking is a great way to get close to nature and if you have a quality kayak makes it thrilling. With kayak fishing, you can get into areas you normally wouldn’t be able to squeeze into with a regular boat. Thanks for reading and happy fishing!